Visiting Galway City and looking for things to do? This lively yet smallish city near the Atlantic Ocean has a number of attractions you will not want to miss. 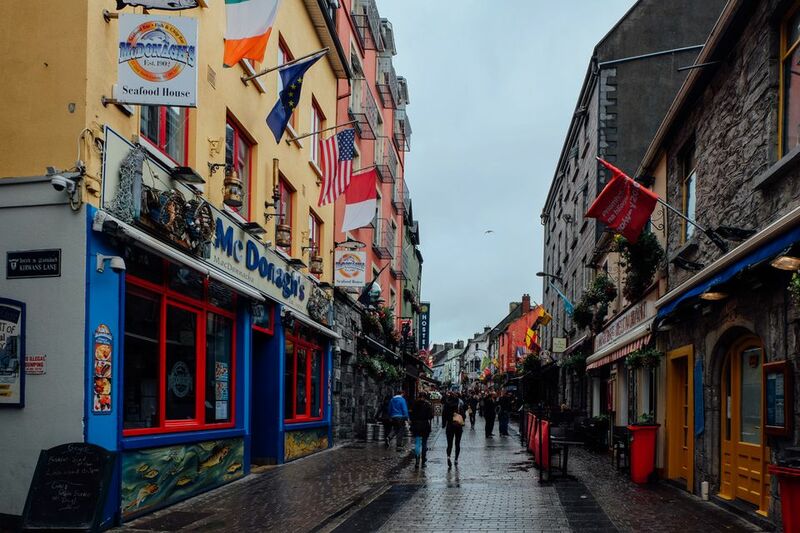 The harbor city is home to poets, artists, and musicians – all of whom contribute to the creative buzz that pulses through Galway’s charming streets. The historic Latin Quarter still has remnants of the city’s medieval walls, but these days the stone lanes are filled with one-of-a-kind boutiques, specialty coffee shops, and friendly pubs that regularly host fiddlers for triads (traditional music sessions) and crowds of locals out for a bit of craic (Irish for fun). Explore the scenic center, interesting sights farther off the beaten track, and plan an unforgettable day trip in order to experience all of the best things to do in Galway. The center of Galway is small and easy to navigate on foot. Taking a self-guided stroll through the downtown area is the best way to get your bearings. Galway is a walker's dream because many areas of the city are pedestrianized and ban cars. Skip the bus tours and spend the first half hour in town having a wander through the central area in order to find your bearings. Medieval Galway is hidden in plain sight and seeking out the traces of the historical past are one of the best things to do in town. The Browne Doorway on the north-western side of Eyre Square is the first example of Medieval Galway that most visitors find. Another example is Lynch's Castle in Shop Street, a fortified town house that acted as home and office for a wealthy merchant. In fact, merchant families were the "tribes" that gave Galway the nickname of "City of the Tribes." Nearby is St. Nicholas' Church, also a centuries-old building with a lot of history. From here step down to the Corrib and see the famed Spanish Arch, plus part of the city walls. The most interesting section of these walls is, however, to be found in the Eyre Square Shopping Centre. From the Spanish Arch, cross the Corrib on Wolfe Tone Bridge, take a left onto Claddagh Quay and then, via Gratton Road, walk to the Seapoint Promenade. A walk to the local beach resort area will take you through the many layers of Galway: the merchant city, the more working-class area of Claddagh and then finally to the beaches of Salthill with its seaside, restaurants, and rides and games. Expect to hear "Galway Girl", a song penned by US country star Steve Earle, on repeat and pack your swimsuit to plunge off Black Rock diving tower. Every Saturday market stalls appear around St. Nicholas Church and provide an eclectic mix of handmade crafts and food with organic and international flavors. From farm fresh vegetables grown nearby, to a bewildering assortment of hats, as well as South African sausages and fish caught in local waters, there is something for everyone. On a sunny weekend, it is the perfect place to stop for lunch before continuing to explore the sights around town. Galway's location on the west coast of Ireland is as tasty as it is picturesque. The area along the Atlantic is home to the Galway Native Oyster. Every year in late September, visitors flock to the harbor city to feast on seafood at the Galway International Oyster Festival. Even if you arrive outside of the festival period, you can still find the local oyster at many area restaurants, particularly in Salthill. It is the city's most prized local food so don't be shy about slurping a few down. It is said that famed explorer Christopher Columbus first got the idea to sail westward to India while in Galway when he saw some strange fruit being washed ashore. There are variations of this legend and it might not be true. An inconspicuous stone monument near the Spanish Arch (where Columbus would more than likely have visited on trade voyages) reminds us of the legend. There is a popular story that Columbus prayed in Galway's St. Nicholas' Church before crossing the Atlantic. Apart from the older St. Nicholas Church mentioned above, you should also take a walk up the Corrib and then cross over the Salmon Weir Bridge to Galway Cathedral. A Catholic statement in stone, the impressive cathedral is big, Byzantine and in places bizarre. Find the rare depiction of St. Joseph at work (with the Virgin Mary sweeping the floor behind him) on one wall. Or have a look at the Chapel of Resurrection, where Irish revolutionary Patrick Pearse​ and US president John F. Kennedy are portrayed as saints-in-the-making. There is nothing like some rainy Galway weather to make you crave a good book wrapped up next to the fire. Luckily, the city has a shopping scene that accounts for all needed creature comforts. Family run since 1940, Kennys Books is the local favorite for new and used books in the center of the city. For more bookish fun, visit the Nora Barnacle Museum to see the former home of James Joyce’s wife and learn more about their lives. Pick a book by Ken Bruen for a taste of local fictional hero who hails from Galway. If you like your detectives defective, Ken Bruen's Jack Taylor beats out nearly every other P.I. in history. The Galway man tackles local crime with a vengeance if roused, all the while fighting his own demons and dealing out justice in a haphazard style. The plots are often sloppy to non-existent, but the books are a fine read for those looking for a fictional approach to complement a trip to Galway. Spend a sunny evening in Nimmo's Pier or the Long Walk with Jack Taylor, then take a taxi back to your lodgings and make sure you are locked in securely. Pints are probably the first beverage that ​comes to mind in Galway, but the city has no shortage of morning drink options as well. A growing specialty coffee scene led by Coffeewerk + Press keeps the city well caffeinated. Pop in for a flat white made with artisan roasted beans, or opt to totally unplug with the wi-fi free zone and slices of vegan cake at The Secret Garden. Galway is, at any given time, full of street musicians known as "buskers." These spontaneous live singalongs are especially common during summer when dozens of musicians and performance artists line the sides of Quay Street, High Street, and Shop Street. Some of the buskers have a real talent, while others are applauded more for their happy attitude than actual musical ability. Between the guitar-strummers expect to find charity collectors and street vendors who are a part of the general mix and add to the festive feeling of what would otherwise be a standard Saturday stroll through town. There are plenty of amateur musicians to be found on the streets of Galway, but the musical city is also well known for its traditional Trad sessions. Order a pint and settle in for Irish music at Taaffes Bar, which has Trad music sessions seven days a week. Tig Cóilí is another popular bar for live music any day of the week. Both bars are on Shop Street in the heart of the city, so it is easy to bop between both to maximize the music experience. One of the best castles in Ireland is tantalizingly close to the city of Galway and sits regally right on the shore of Galway Bay. Dunguaire Castle was first built in 1520, but the fortified tower house has been fully restored and now has a small museum. During summer months, you can even attend a medieval banquet in the castle halls to experience what it would have been like to live there nearly 500 years ago. The rocky isles of the Aran archipelago are some of Ireland's best islands and lie just off the coast of Galway. Catch the ferry from Galway Harbor to discover the raw beauty of the windswept Aran Islands, and spend enough time on these Atlantic outcroppings to explore the ancient ruins that are found there. After the buzz of Galway, the islands make for an ideal day trip to reconnect with Ireland's natural wonders.